That’s a photo from last year, and as always, it was a great day of watching airplanes and eating burgers. As a reminder, this is entirely unorganized. No RSVP is needed, and there is no program. It’s hard to even call it an event. Just show up if you’re in the area and talk shop with others who have gathered to do the same. As in past years, some airlines have sent some swag over to give away. That includes a model from British Airways, retro hats (and more) from American, and this year, for the first time, there are even a couple of free tickets to give away courtesy of Spirit. I hear United is sending something along as well, and if the rumors are true, it’s going to be something REALLY cool. Even DFW got into the act and sent a bunch of swag. It should be a fun couple of hours. If you’re in the area, swing by and say hello. If you want more, well, then you’re in luck. NYCAviation is putting on its SpotLAX18 the same weekend, just like last year. Get more details here. I’m coming for the first time this year and I can’t wait! I’ll be there. This will be my last time staying at the LAX Marriott since they changed their elite status perks and made the lounge a Platinum perk instead of Gold. The lounge at the top of the building was the only reason to stay at the Marriott as it had great views overlooking 25L/R. No way can I requalify as a Platinum so next year it’ll be the H Hotel when I’m in L.A which lets guests go up on their rooftop deck. Sorry, but do you know the definition of “dork”? Perhaps nerd or plane geek might be more appropriate. I think the name “nerd” has already been taken by another airline-fan event, that annual gathering in Seattle that features Boeing plant tours and such…. I’ll see your dork and raise you the historic definition of “geek”. If I have swag to donate from Alaska Where can I send it? Steve – From Alaska Airlines? 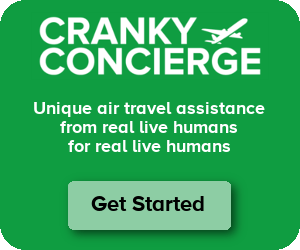 You can email cf@crankyflier.com to discuss if you’d like. Can we still take The Parking Spot shuttle? Shannon – As far as I know, you can if you’re a member of the Spot Club. In past years they’ve asked to see a parking slip, but just say you forgot it in the car and they let it go.